After our tour of Bontoc Museum, we all returned to our jeepney and proceeded to Tchayapan Restaurant near the municipal hall. 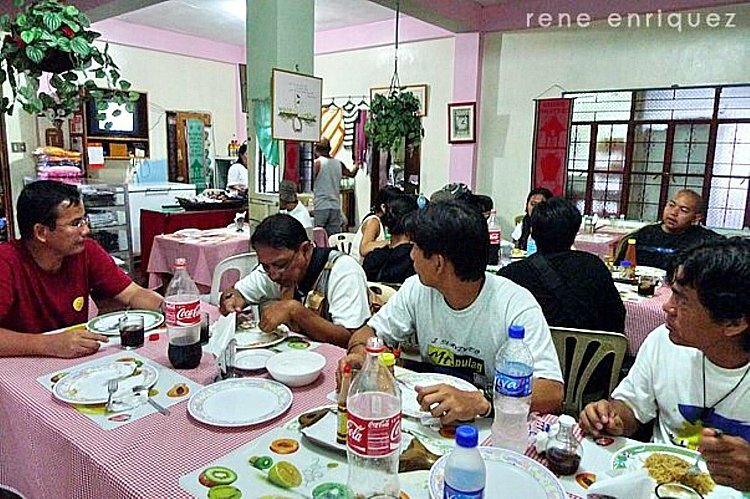 Said to be Bontoc’s biggest and best restaurant, I ordered the restaurant’s signature best seller Tchayapan Rice, Bontoc’s version of lechon kawali. It is served with buttered fresh and crunchy vegetables on the side. Jandy, on the other hand, preferred the Tchayapan Beef Rice with the same sidings. Both cost PhP80. For the same price, they also offer beef ampalaya rice, chicken rice, sweet and sour pork rice, sweet and sour pork/fish, pinapaitan, beef/pork steak, cheese burgers, pancit canton/bihon and chopsuey. Chopsuey rice costs PhP70. They also offer chicken spaghetti (PhP100), spaghetti (PhP40), sandwiches (ham and egg, ham and cheese, tuna, PhP35; cheese, egg, PhP30). On our return to Banaue, Jocie, our tour coordinator, tried out the local delicacy called pinikpikan. Here, the chicken is bloodlessly killed by slowly pummeling its body with a stick or reed so that the blood remains inside. After the feathers are singed off in an open fire, the chicken is then chopped and boiled with dried salted pork called etag and simmered with vegetables. Tchayapan also offers budget travelers 7 single/double rooms (PhP150/head)with common bath (2 male and 2 female) and 4 double bedrooms with private bath and TV (PhP300-800). 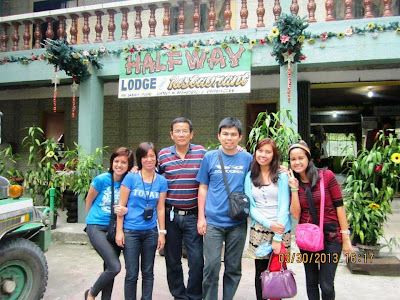 Tchayapan Inn & Restaurant: Bontoc, Ifugao. Mobile number: (0929) 683-9607 (Ms. Florence N. Taguiba). Restaurant open daily, 8 AM-8 PM. 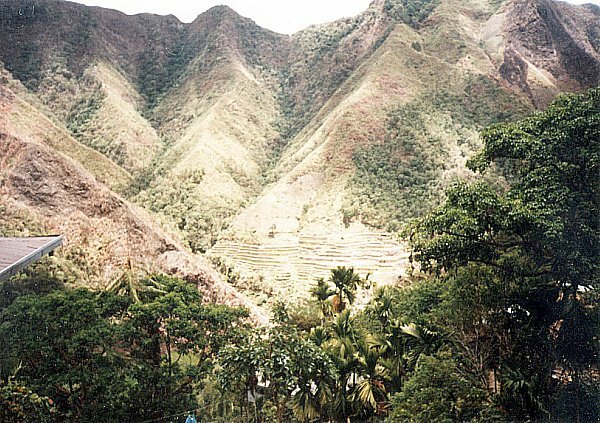 From the Grand Viewpoint, we proceeded on our way to the provincial capital of Bontoc and made a short stopover at the Mt. Polis Viewpont, along Mountain Province-Ifugao border, a regular peeing and supply stopover for bus and jeepney passengers. Here, you can find a huge 30-ft. high statue of the Blessed Virgin Mary which ironically stands between 2 giant cellular communication towers. The statue was said to have been erected to provide divine protection for the towers by dissuading NPA rebels from lobbing grenades at the facility. For added protection, there’s also a police detachment that watches over these towers. An unusual sign that I found here reads “DPWH Gender & Development Park.”Gender and Development (GAD) is a program that aims to address the physical needs of motorists along our national road network. Gender-responsive roads have beautified road and road lines, public toilets, visible road signages, informative and directional signs and warning signs (which include reflectorized stickers and paints on guard rails), and concrete pavements to give motorists early reaction time thereby preventing the occurrence of vehicular accidents due to lack of road signs. On the south side of the highest point of the road (1,920 m.) is the 2,255 m. summit of Mt. 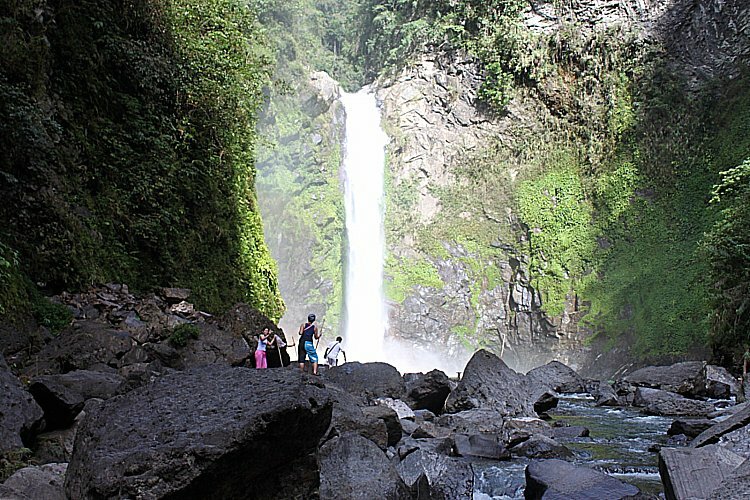 Polis, a birdwatcher’s paradise and home to a tropical, mossy forest. This should not be confused with the 1,829 m. high Mt. Polis in Sagada, a popular trekking site. Fresh, really cheap organic vegetables, straight from the farm below us, are sold along the road. Cheap, freshly brewed but bland upland coffee is also sold at coffee shops (Hannah’s Store, Coffee Hop & Restaurant; Mt. Polis Rolling Coffee Shop; etc.) along the road. Thick fog usually engulfs the place during the early morning. After breakfast at Halfway Lodge, we all returned to our jeepney and traveled 3 to 4 kms. (25-mins.) 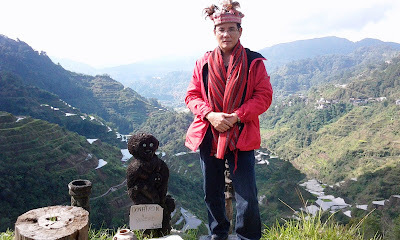 uphill from the town, along the Banaue-Bontoc Rd., to the Banaue Grand Terrace Viewpoint, one of three viewpoints in the town. The other 2 viewpoints are the NFA Viewpoint and the Dayanara Viewpont, named after 1994 Ms. Universe and former Aga Muhlach girlfriend Dayanara Torres (who later married singer Marc Anthony but has since been divorced). This would be my first visit to the place as, during my first 2 visits , I just used the town as a jump-off point to Batad Rice Terraces. Besides, the town’s undulating tin roof tops and overhead, tangled electrical wires, weren’t exactly an endearing sight for me. 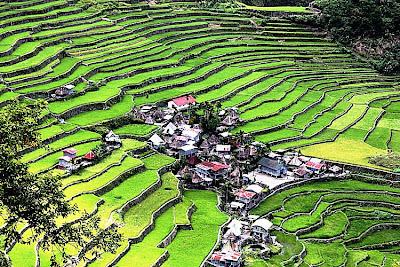 This popular photo spot, situated on top of a plateau at the outskirts of the town, affords a perfect view of the 2,000 year old, man-made and iconic Banaue Rice Terraces (the one we see in books, magazines, postcards and the PhP1,000 bill) and the magnificent valley to the poblacion. 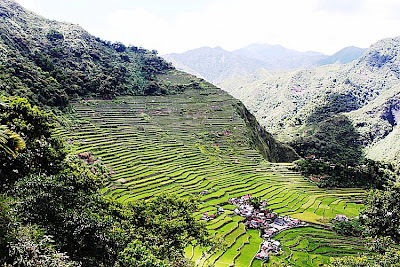 Though not included in the UNESCO World Heritage Site inscription, due to the presence of numerous modern structures around the area (making it score low in the integrity criterion of UNESCO), these rice terraces are still a National Cultural Treasure under the Ifugao Rice Terraces. The early morning cast an extra dimension to the rice terraces. The terraces, on a rather steep incline, occupy a narrow, high spur in the mountain. The best time to see these rice terraces is from February to May when it is least likely that the views will be obscured by fog or clouds. Elderly, smiling Ifugaos often come here in full tribal regalia and tourists can pose for the camera with them, for a fee or donation of course, or you can be dressed in partial tribal regalia (headgear and shawl) then leave a small donation for its use. At the viewpoint are a number of roadside souvenir shops crowded in a small area. 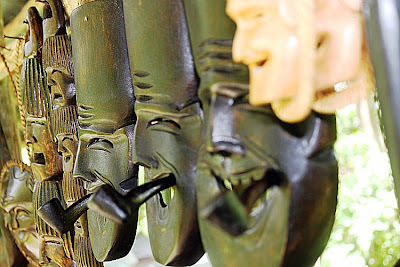 They sell a variety of handcarved woodwork, from the iconic bul-ol (rice gods placed in village huts and granaries), spears, canes to Chinese dragons. They also sell food (strawberry jams and preserves, peanut brittle, wine, etc. ), textiles (sweaters, caps, T-shirts, shawls, etc. ), ref magnets, trinkets, furniture and basketry. 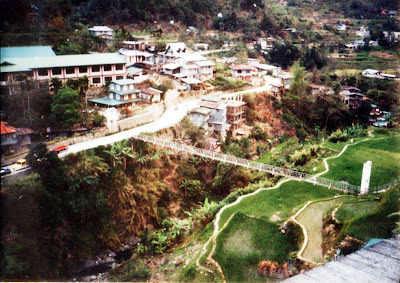 Also with the area was an inn (the 3-storey Viewpoint Valley Inn) and a restaurant (Banaue Heritage Cafe & Restaurant). There were also wooden scooters on display. One in particular, with the ornate dragon design, caught our fancy. We each took poses (at PhP10 per shot) on this scooter. Also, if we wanted to, we could have taken it on a test drive (for PhP50) down the road but the absence of a built-in brake held me back. Our bus arrived arrived at Banaue town proper by 7:30 AM, a full hour past the normal 9-hr. trip it would take from Manila. This would be my third visit to the town and the second for Jandy who first visited it last April 11, 1998, nearly 15 years ago (he was just 12 years old at the time). 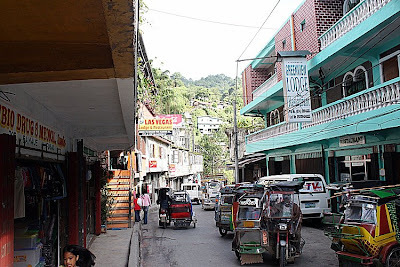 Upon alighting from our bus, we boarded a chartered jeepney that took us to the nearby 2-storey Halfway Lodge where we were to have breakfast at its big, ground floor restaurant. Breakfast was nothing out of the ordinary: an omelet, pork tocino and fried fish plus 3-in-1 coffee but what was unusual, at least to the first timers in this part of the country, was the aromatic tasty and healthy native kintuman (called tinawon in Kalinga) the red rice grown at rice terraces. This same rice is fermented to produce tapuy (rice wine). A kilo of this rice sells for PhP85-90. The lodge also has two single rooms and 13 double rooms with ensuite bath or common bath, all capable of accommodating various-sized groups (PhP500 for single person, PhP800 for 2 people and PhP250/head for groups). Their rooms are said to have no outlets though and you have to charge your electronic gadgets (cellular phones, laptops, etc.) for a fee. The restaurant balcony had a great view of the town, rice terraces and the Ibulao River (crossed by a hanging bridge). Halfway Lodge and Restaurant: Poblacion, Banaue, Ifugao. Tel: (074) 386-4082. Mobile number: (0915) 465-8921 and (0919) 614-2266. Website: www.banauehalfwaylodge.com. Come morning it was decision time for the group. There were two options left for us before leaving Batad in the afternoon. For the still adventurous, me included, there was the 30-min. (according to the locals) hike to Tappiya Falls, something I haven’t done during my first visit (which was just a day tour way back April 1998). 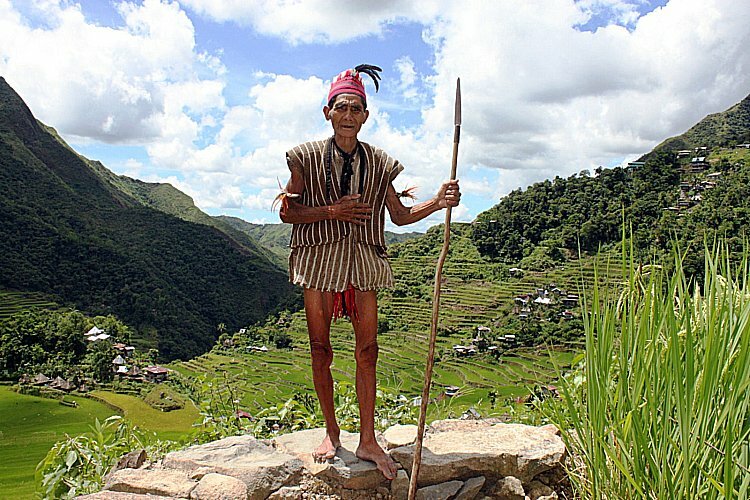 The other was an easier hike down to Batad Village proper to photograph village life. I chose the former but half opted for the latter. Joining me to the falls were AACC members Jun, Steve and Rosevie plus Pearl, Phoebe, Ivy, Arvic and our local guide Mang Vicente. After a hearty but very early breakfast, we all left Simon Inn by 7 AM, taking the same route to the Central Viewpoint. Beyond the rice terraces, it was a slow, lung busting and steep (with slopes reaching 45 degrees) hike. A meandering river soon came into view, indicating how near we were to our destination. Across this river and upstream along the far bank was the beautiful and impressive, 25-m. high waterfall with its enormous swimming natural pool. We were in luck as running across the falls was a rainbow, making for another beautiful and rare photo op. While the others went bathing, Jun, Vi, Steve and yours truly started clicking. After 30 mins.of this bather’s and photographer’s heaven, it was time to go as we had another long hard climb ahead. A rest stop at the Central Viewpoint provided an opportunity to pose (for a fee) with Apo Ben, an Igorot dressed up in full tribal attire (complete with g-string, native spear and feathered headdress). We arrived at Simon Inn by 11 AM in time for a well-deserved lunch we had no more time for a power nap as we had to pack our stuff and leave. Bebet and Bryan had left by then to allow themselves longer rest stops. We left the inn with our porters by 1 PM. The hard part was the hike, now uphill, to the Saddle but from here it was downhill all the way to our pick up point, arriving by 4:30 PM. The debris from the landslide had been cleared by then. We reached our destination and home for the night, Simon Viewpoint Inn and Restaurant, by 3 PM. 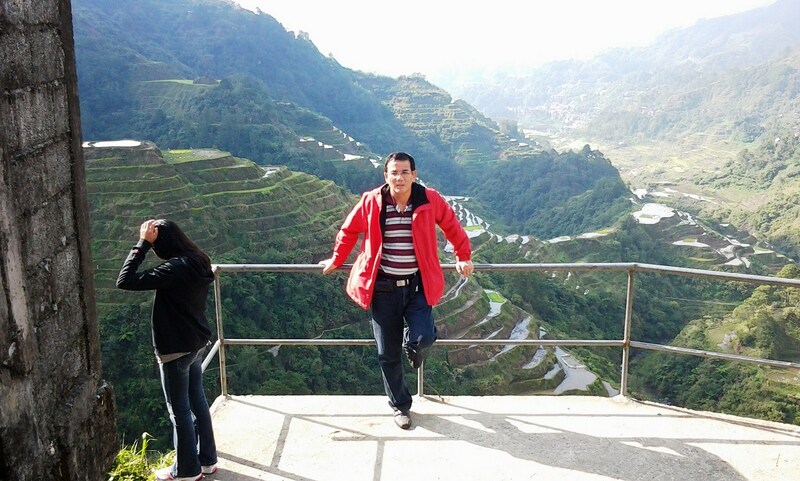 At its concrete, railing-less view deck was the breathtaking amphitheater vista of the Batad Rice Terraces. Our AACC photographer friends soon set up their tripods and their cameras started clicking away. The inn also had a pair of seemingly authentic rectangular and nailless one-room bale huts at the back which I enjoyed exploring. Used for cooking and sleeping, the huts are built on four sturdy amugawan tree trunk posts, 2-3 m. from the ground, to keep the vermin out. 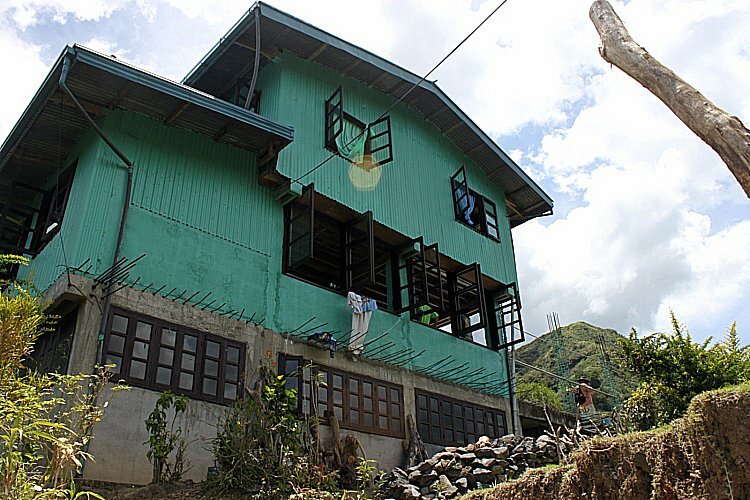 My access to the hut was through a steep, removable bamboo or wooden ladder. 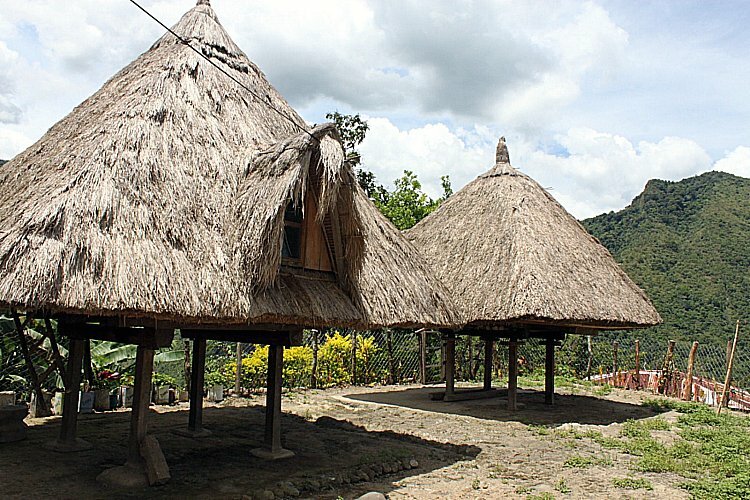 The hut also has outward slanting waist or chest-high walls, two doors, a wooden plank floor and no windows. The steep, pyramidal, reed and grass-thatched roof conceals the walls. After a late lunch and a short power nap to recharge, I joined the others as they left to explore the Batad Rice Terraces up to the Central Viewpoint. However, to get there, I had to conquer my acrophobia (fear of heights) as I had to traverse a lot of very narrow and high pilapil (terrace walls) along the terrace’s edges to get there. Once back in Simon’s Inn, we again rested our tired bodies, some having their aching muscles and joints massaged by a local masseuse. 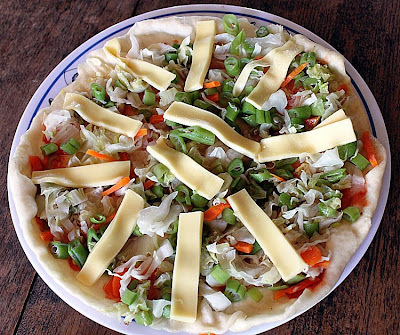 That night, it was all camaraderie, good food (pizza, pita bread, highland rice, veggies, fries, etc. ), wine (native rice wine called tappuy) and song (provided by the guitar-playing and crooning Jules). Lights out at the inn was 10 PM and gladly so as we were all dead tired. Sleep came easy to the weary. This stupendous amphitheater of stone and earth terraces was sculpted out of twin coalescing spurs of a steep, wooded mountain from riverbed to summit. 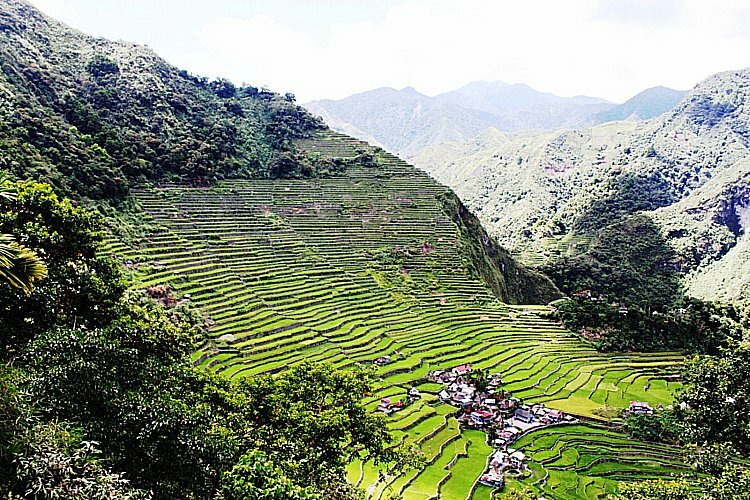 Considered as the “Eighth Wonder of the World” by many, belo it is the relatively unspoiled Batad Village. These masterpieces of agricultural engineering are said to be the highest of its kind in the world and the largest single agricultural project in the history of mankind. The terraces are estimated to be more than 100-sq. miles in area, reaching heights of 1,500 m. and its length, if put end to end, would extend 48,280.40 kms., encircling half the globe or extending 10 times the length of the Great Wall of China. Our hired AUV was soon on our way, along the often dusty but now muddy Mayoyao Rd., to the Km. 12 Junction (called the “Saddle”), take-off point for the hike to Batad Rice Terraces. However, we only made it halfway as a fresh landslide, brought about by heavy rain the night before, blocked our way, adding another 6 kms. to our already arduous 4-km. hike. Luckily, there were local porters to carry our backpacks (at PhP200/pack, 2 packs per porter, placed front and back). Still, this wasn’t going to be a walk in the park as our group had to hurdle, aside from the landslides, tired and aching muscles, sore feet, rough mountain trails (sometimes narrowed to footpaths where only one person at a time could pass) and deep, treacherous ravines. Even in the cold, refreshing mountain air, most were sweating profusely due to the hot sun. Would-be backpackers soon gave up their backpacks to the porters, one had a bout of gout (nice rhyme), another, a diabetic, collapsed from insulin shock and another was on the watch list (having had a quadruple bypass). Just the same, the photo opportunities were great, with lots of rice terraces, forest-cladded mountains and rivers to shoot, plus there were about six rest stations offering relief and refreshments (as well as souvenir items) to hikers. From the Saddle, it was an easy downhill hike most of the way. 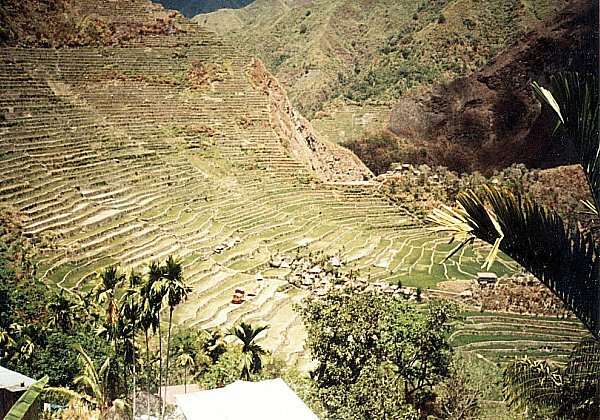 My first trip to Banaue, Ifugao and its showpiece, the stupendous Batad Rice Terraces (the “Eighth Wonder of the World”), was way back in April of 1998 (http://firingyourimagination.blogspot.com/2011/08/ifugao-day-tour-of-batad-rice-terraces.html) with my then 11-year old son Jandy. Back then there were no celphone signals (making my celphone useless) and the camera I brought with me was an instamatic Canon Sureshot Joy using now rarely-used roll film. Since then, I have been pining for a return. Well, wishes do come true and I have returned. Though now without Jandy (he had a cold) or my daughter Cheska (she had commitments), I was traveling with seasoned professional photographers – Mr. Steve Albano, Mr. Jun Bagaindoc, Mr. Jules Capucion, Mr. Nonie Castillo, Ms. Mel Dimapilis, Mr. Rene Enriquez, Mr. Bebet Gaudinez, Mr. Lawrence Bryan Lee and my good friend and frequent travel companion Ms. Rosevie Sevilla; all members of the Ayala Alabang Camera Club. Our group also included master guide Mr. Lester Susi plus sisters Pearl Giselle and Phoebe Uno, Ms. Ivy Belimac and Mr. Arvic Camua. To put on some professional air, I brought with me my daughter’s Canon EOS 500D digital SLR which I recently bought in Singapore. However, this was mostly for show as it was set in automatic. We left Manila on January 26, 9:30 PM via an airconditioned GV Florida bus at its terminal along Lacson St, near Espana Ave. (near U.S.T.). One thing nice about this bus was it had its own toilet, convenient for this long-haul 341-km./10-hour trip which including stopovers. As soon as the bus left the terminal, we all tried to grab some shuteye. Our trip was uneventful and our bus arrived in Banaue 7 AM the next day. Our group was picked up by a hired AUV which brought us to People’s Lodge and Restaurant for breakfast. 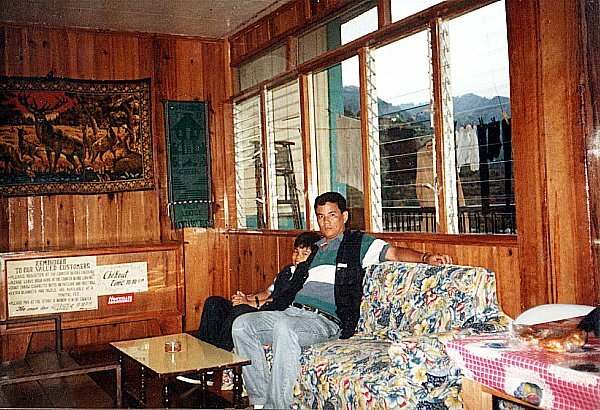 Nostalgically, this inn was the same place me and my son Jandy stayed in during our first visit. While waiting for our food, we tried out its balcony. 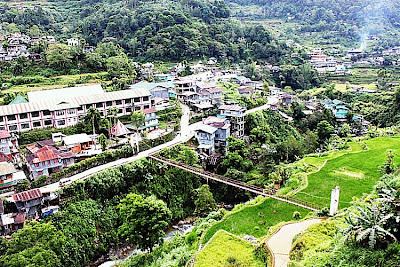 Here, we had a panoramic view of the town, its backdrop of rice terraces and the winding Ibulao River which was traversed by a hanging steel bridge (which, in the past, I tried to cross but chickened out half way). Once done with breakfast, Mel, Rosevie and I explored the nearby handicraft stores for some souvenir shopping. The shopping options include different kinds of traditional fabric like the woven bark cloth and dyed ikat cloth, wooden objets d’art such as bowls, trays, oversized spoons and forks, antiques, entirely alien statues of American Indian chiefs and smiling, pot-bellied Chinese gods, and the traditional bul-ols (statues of rice gods). Curio souvenirs include handwoven wall hangings, crocheted bedroom slippers and pfu-ong (traditional jewelry) representing good luck in hunting or prosperity of children. Once done, we returned to our group and the AUV for our trip to the jump-off point for our hike to Batad Rice Terraces. A stay in Banaue is never complete without visiting the Batad Rice Terraces. Seeing it is a “must” but getting there is no picnic as I was soon to find out. The next day, April 12, Easter Sunday, after an early morning breakfast at the inn, Jandy and I were joined by Asia, Min-Min and Tom as we proceeded to the Trade Center. Here, we hired a jeepney for PhP1,500 and waited awhile for other hikers to join us, our intention being to split the bill even further. There were no takers. We decided for the 5 of us to go at it alone. The Batad Rice Terraces are located 16 kms. from the town and 12 kms. of the distance can be traversed, over the dusty Mayoyao national road, by our jeepney. 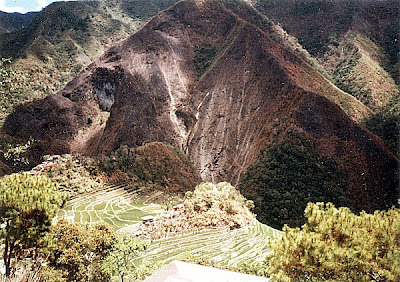 Luckily for us, there were no sudden occurrences of landslides triggered by too much heat, it being the peak of the El Nino season. We safely made it all the way to the junction at Km. 12. From hereon it would be hiking for the rest of the 4-km. distance. Jandy and I had on our indispensable media jackets (with its many pockets) and I brought along bottled water and my Canon point and shoot camera and videocam. The 2 to 3-hr. uphill/downhill and winding hike is demanding, but rewarding for hardy and seasoned hikers in good physical condition. I didn’t exactly fit in that category as I wasn’t in good shape. Jandy, a specimen of good health, kept egging me on – as I was huffing, puffing and sweating profusedly (even in the cold mountain air) – so I could keep up with the group, being the frequent tailender. Luckily, for me, there were about 6 waiting sheds offering refreshments (as well as souvenir items) to hikers. The rugged mountain trail sometimes narrowed to footpaths where only one person at a time could pass. Below us were treacherous ravines. Fog sometimes blanketed these trails. After a few hours we emerged at the Batad “Saddle” in Bohr-Bohr, a landmark station in Cordilleras used to gauge the distance stretching to Batad. After another arduous hike, we finally reached our destination – the Simon Inn Viewpoint and its breathtaking side vistas of the Batad Rice Terraces. 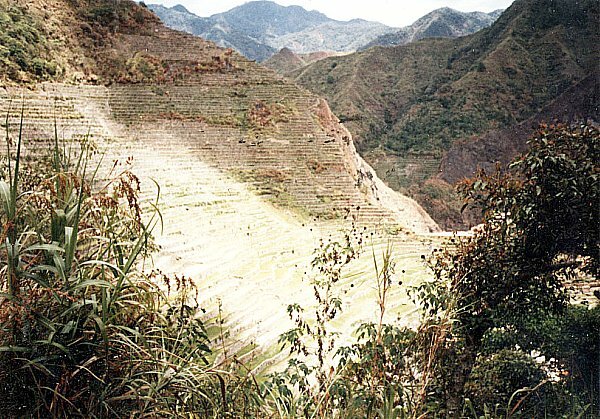 This stupendous amphitheater of stone and earth terraces, sculpted out of twin coalescing spurs of a steep, wooded mountain from riverbed to summit, are considered as the “Eighth Wonder of the World” and, unlike the more famous Pyramids of Egypt built by slave labor, were built in the true bayanihan spirit (system of helping each other without fees). However, the rice terraces weren’t as green as I would have wanted them to be, again it being the height of the El Nino phenomenon. Below the viewpoint and adjacent to the rice terraces is Cambulo Village, a typical, unspoilt Ifugao village with two lodges and pale Hershey Kisses-like roofs in the midst of terraces. My 3 companions decided to visit this rustic cobblestoned village where the ancient craft of bark cloth weaving thrives. Going down seemed easy but I dreaded the uphill return trip so I opted to stay behind and admire the view instead. Too bad I didn’t bring any extra clothes with me. It would have been nice to have stayed overnight. Maybe next time. My 3 companions returned after 2 hrs.. After a 3-hr. stay (including lunch at the inn), we retrace our way back, under a more comfortable late-afternoon sun, to the Km. 12 junction where our jeepney waited for us. Unlike our previous trip, our jeepney was now filled to capacity with foreign and local hitchhikers all thankful for the free ride back to town. They then left us to settle our bill with our driver. The nerve!!! Jandy and I then proceeded to the Autobus ticket office at the town center to reserve bus seats as there was only one trip back to Manila. Asia, Min-Min and Tom planned to spend an extra day in Banaue. Afterwards, we returned to People’s Lodge for a well-deserved dinner and rest. The next day (Monday), after a very early breakfast at the inn, we proceeded to the Trade Center where we boarded our Autobus bus for the 347-km. (10-hr.) long-haul trip back to Manila via the Dalton Pass in Nueva Vizcaya. Although the bus was branded as “aircon,” it would have been better for us to open the bus windows as the airconditioning wasn’t working. It was hot all the way. However, as soon as we reached the lowlands, my mobile phone became useful again. Thank God. It was getting late and we had to find lodgings by nightfall. After a short but tiring uphill search at the town center, we decided to stay at the People’s Lodge & Restaurant, a pension house, where we took 1 of its 15 double rooms with common bath for PhP100 per head. Quite cheap. The inn also had 6 double rooms with bath, a bakery, restaurant and an all-important telephone. Viewof the Ibulao River from our inn. Ever since we left Baguio City, my cellular phone just became useless baggage and I took the opportunity to make a long distance call to my wife Grace who hasn’t heard from us for 5 days. 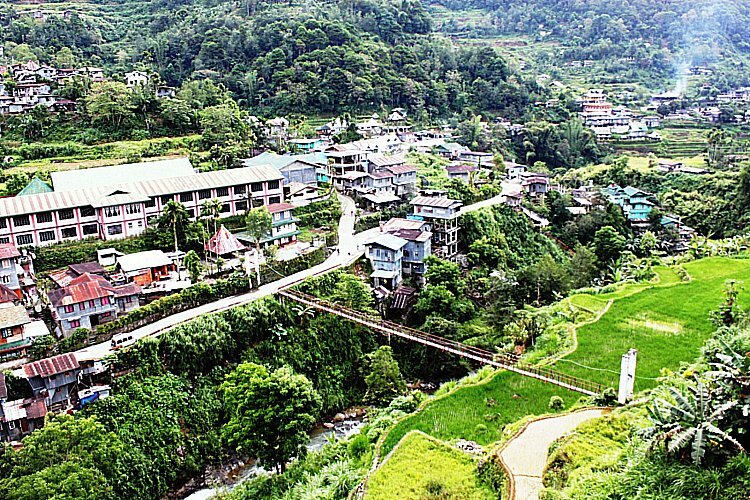 From its restaurant, we had a beautiful view of the town, the banks of the scenic Ibulao River (traversed by a hanging steel footbridge) and a backdrop of rice terraces. Coincidentally, Asia, Min-Min and Tom also happened to be staying here and, together, we made plans for a joint early morning trek to the Batad Rice Terraces. After an early dinner and a very very cold shower, Jandy and I retired for the night. People’s Lodge & Restaurant: Banaue-Mayoyao-Potia-Isabela Rd., Banaue, Ifugao. Tel: (074) 386-4014 to 15.